For insects, flying is a swift way of getting around to find food, identify a mate and escape unfavourable conditions. While muscles provide the power for flying, it is the brain that coordinates strategic planning. For a hungry fly, this could mean using its powerful olfaction to sense the presence of food such as a rotten banana and then navigating the distance to reach it, which may require flying for several minutes or even an hour or more. How does the insect brain coordinate the timing for such long flight bouts? A group of scientists at the National Centre for Biological Sciences, Bangalore, have answered this question in the fruit fly Drosophila melanogaster. In their recent work published in Current Biology, a team led by Prof. Gaiti Hasan and her collaborators describe how groups of different neurons connect up to make insect flight possible for longer periods. One set of neurons release an inherent brake in this circuit, allowing flies to maintain flight for long durations. While mechanical and biophysical aspects of insect flight are well studied, the neurobiology and circuitry underlying it remain poorly understood. Steffy Manjila, a graduate student in the lab, began this project by first asking what are the types of neurons required to maintain long flight. Neurons talk to each other with chemicals called neurotransmitters. One class of neurotransmitters called monoamines, such as octopamine, dopamine and serotonin are known regulators of insect flight. Particularly, loss of octopaminergic neurons prevents fruit flies from flying for long periods. Steffy recapitulated this earlier finding and used genetic tools available in Drosophila to narrow down which octopaminergic neurons in the fly brain are active during flight. She then hunted for neurons that could be talking to these octopamine neurons and identified a cluster of dopamine producing neurons known as Protocerebral Anterior Medial (PAM) neurons. An elegant imaging experiment showed that activation of octopaminergic neurons generated calcium signals in the PAM neurons, which is a cellular readout of neuronal activity. To understand how PAM neurons regulate flight bout durations, their projections into a region of the brain called the mushroom body were investigated. This mushroom shaped structure is much like a shopping plaza – a place buzzing with ‘activity’ and exchange of molecular information. It is well known for its role in learning and memory. The complexity of the mushroom body lies in the fact that one neuronal branch receives inputs from multiple others in its vicinity. These inputs are consolidated by the output neurons, that convey information out of the mushroom body to disseminate composite messages downstream. For example, in the case of flight the mushroom body might balance the state of satiety and hunger with the smell of a ripe banana, to decide how much energy the fly should expend to reach the banana. Steffy identified a class of mushroom body output neurons whose arms were in close proximity to arms of the ‘flight modulating’ PAM neurons. These output neurons were GABA producing cells, a well-known inhibitory neurotransmitter, which upon binding to its receptor on another neuron would turn it off. Why would the flight circuit have neurons that turn other neurons ‘off’? Shouldn’t all the neurons be turned ‘on’ for flight? “Imagine driving your car down a slope, with your foot on the brakes. If you want to gently roll down the ramp, all you have to do is relax your hold on the brakes. That’s exactly what we think could be happening with the flies. At rest, the GABAergic output neurons are active and release GABA. This inhibits flight – brakes pressed. However, soon after initiation of flight, dopaminergic PAM neurons actively inhibit GABAergic neurons, thereby reducing GABA release. The brakes on the flight circuit are now relaxed and this enables the fly to sustain a longer flight bout”, explains Dr. Hasan. Overall this mechanism probably helps the fly conserve energy. The authors substantiated their ideas with a few more experiments. Using genetic tricks, they demonstrated activity in the PAM neurons during flight. Then they artificially turned “on” the dopaminergic PAM neurons and observed that activity of the GABAergic output neurons was silenced. They also made the GABAergic output neurons continuously turned “on” and observed that these flies were unable to fly for long durations. Finally, in a collaboration with the labs of Prof. Sanjay Sane at NCBS and Prof. Jean-Francois Ferveur at Université de Bourgogne Franche-Comté, Dijon, France, they demonstrated that this newly identified circuit is necessary for hungry flies to fly and reach a potential food source, but that it is not required for other free-moving behaviours. The authors propose that similar neuronal crosstalk enables locomotion in mammals also. For example, it is known that in humans, GABA released from a brain centre called the basal ganglion helps maintain a resting state. When appropriate cues are received, these GABA brakes are released to initiate locomotion. So, if you ever thought brakes were designed only to impede motion, think again. 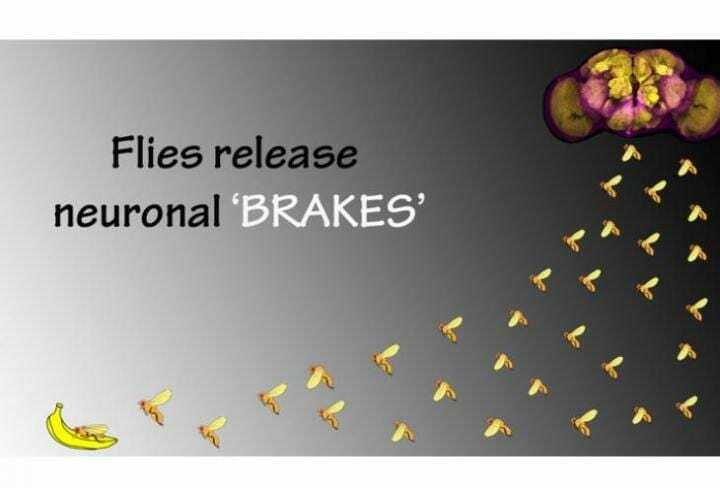 In this biological paradigm, brakes prevent unnecessary flight activity and are relieved only when the fly needs to undertake a long-haul flight!